Banksy may have ‘exited through the gift shop’ but in Toronto s/he might stop to take a look at what are currently the most expensive items in the gift shop at the Art Gallery of Ontario. 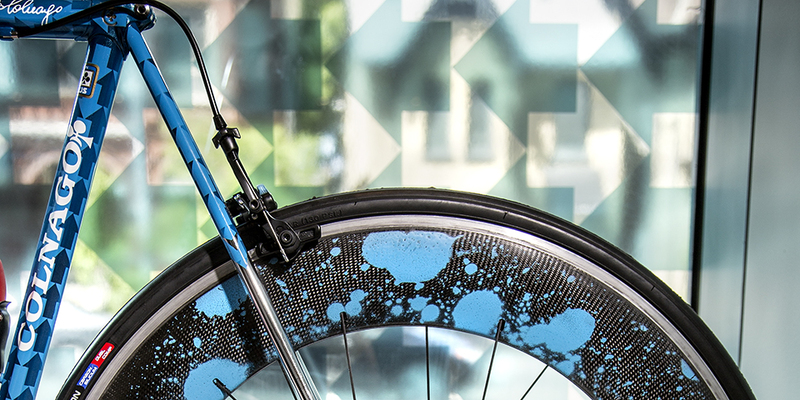 The big-ticket items in question are high-end track bicycles hand-painted by legendary graffiti artists, Stash and FUTURA. One of those bikes cost $140,000. There are three bikes in total that are being sold at the AGO as part of a project titled, Look Ma No Brakes. 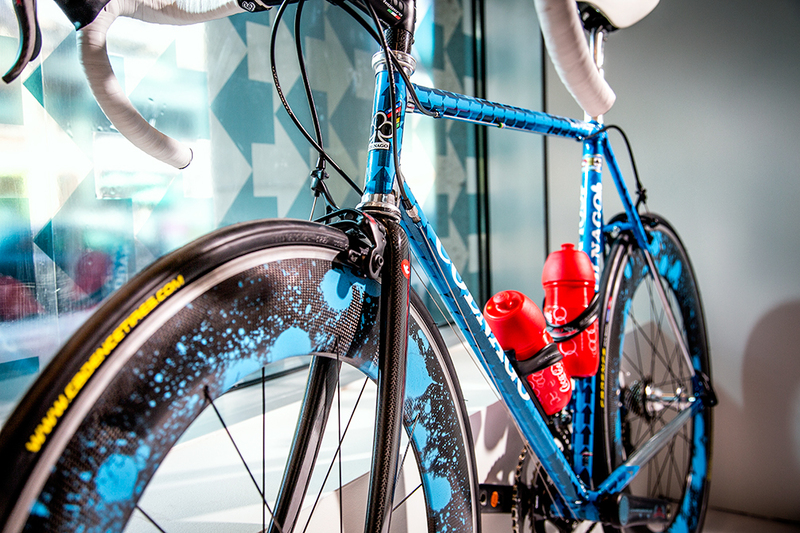 In 2007, the two artists collaborated with Nadir Olivet who owns La Carrera Cycles in Toronto to produce 38 Colnago Master Pista track frames that were painted by Stash and FUTURA. 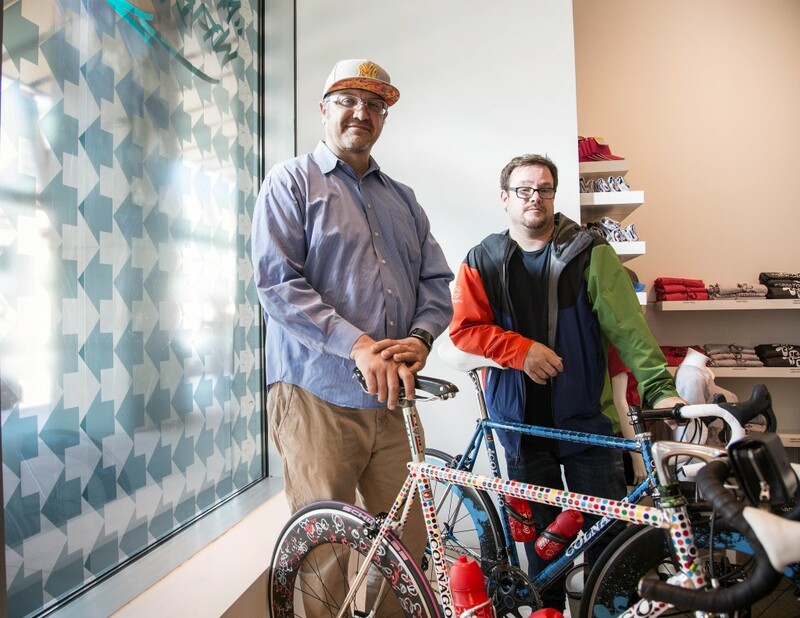 Nadir Olivet (left) with the FUTURA painted bike and Stash (right) with one of the bikes he painted. Recently, Stash travelled to Toronto from New York for the unveiling of the bikes in the window of the AGO. Stash, AKA Josh Franklin, was a pioneer in the street art movement in 1980s New York. His name comes from his tag (Stash), which he artfully painted on subway cars. He says that back then, it was never called “street art,” and was just considered to be something along the lines of delinquent graffiti. He says that his passion turned into a career when he was hired by large companies such as Nike and Reebok to design various lines of sneakers and street wear. “The passion led into growing up and having to pay the bills but still being able to create art and to use that same energy,” said Stash. Both Stash and FUTRUA have deep connections with cycling as FUTURA once had a career as a bike messenger and they both use bikes to navigate the streets of New York. Although Stash is a long-time cyclist, he says that Olivet and this project inspired him to ditch his mountain bike ride a track bike instead. He says that there is definitely some correlation between sport and art that is represented in this project. “It’s the same thing, you know, sport, art, music, skateboarding. You look at skateboarding but people forget that that skater is an amazing artist, “ said Stash. Kirstin Mearns, general manager of retail at the AGO says she is confident the bikes will sell. “People collect bikes and people collect art and I think there could potentially be that person who’s desires are met by this project because from a bike perspective, it’s one-of-a-kind and from an art perspective, it’s one-of-a-kind so it’s a very special piece to have,” said Mearns. Very special, indeed; I’m not sure we’ll be seeing them riding down the rough roads of Toronto anytime soon though.